Carlos Queiroz has completed another surprise U-turn and agreed to stay on as Iran coach through the 2018 World Cup qualifying campaign just weeks after resigning from the post for the second time. "I had a good session with the football federation and Iran's sports minister officials today. 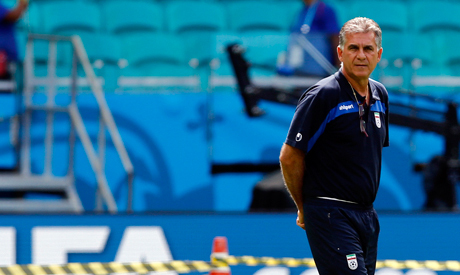 We are looking forward to the future," Queiroz was quoted as saying by Iranian media on Sunday. The former Real Madrid and Portugal manager said in March he would leave the post he has held since 2011 following a bust up with sporting authorities despite fan pleas for him to stay on. "There is a difference of opinion inside the federation. There are almost two federations, with two different opinions," the 62-year-old said after the 3-1 friendly loss to Sweden in Stockholm last month. Reza Hosnikhu, an official brought in to settle the dispute with Iranian Football Federation (IFF) members and the firebrand coach, said the decision was final. "Anyone who doesn't like this can leave the federation since the ministry has concluded to continue with Queiroz. Harmony must now prevail," he was quoted as saying by Dubai outlet Sport 360, citing Iranian media. Queiroz won plaudits for steering Iran to a fourth World Cup finals appearance last year where the side almost held eventual runners-up Argentina to a draw before a late Lionel Messi winner. They also took a point from African champions Nigeria but were knocked out at the group stage after a 3-1 loss to Bosnia in their final match. Queiroz said after the tournament in Brazil he was standing down from the position complaining about a "one-sided marriage" with the IFF, but he eventually did stay on, signing a new contract in September after weeks of negotiating. He led the side to the Asian Cup in Australia in January but Iran were beaten by arch rivals Iraq on penalties after a barnstorming quarter-final contest, with Queiroz furious after Mehrdad Poolad was controversially sent off in the first half. Queiroz continued in the position after the disappointing exit and showed his coaching worth as Iran impressively beat Chile 2-0 in a friendly before the Sweden match. But long suspected rumours he was quitting were confirmed days later. Now, after another U-turn, he will be tasked with trying to qualify Iran for back-to-back World Cups for the first time. They have been drawn in Group D of the second round of qualifiers, which also serves for the 2019 Asian Cup, alongside Oman, India, Turkmenistan and Guam with the campaign starting in June.